Needless to say, I was ecstatic to go home at the end of the term. And I was confident my grandfather would keep his promise to see that we didn’t have to return. But I wasn’t prepared for all the changes in the year we were away. A year is a long time when it’s one tenth of your whole life! During the last months of school, Mother had loomed large in my consciousness as the beautiful fairy coming in from the snow on my birthday. I longed desperately to be embraced in her welcoming arms, nurtured, and restored to life after my long ordeal. The reality was a bit different. Coming home to an unfamiliar house, a mother who seemed a stranger, and a new stepfather, presented certain adjustment problems. Fortunately, we had fascinating neighbors just next door. They were members of a Hungarian circus family who had achieved some fame in their specialties of the high wire and trapeze. They happened to have a little girl exactly my age. She had a long, unpronounceable name, but I just called her Hetty. A large, empty lot between their house and ours, owned by Hetty’s family, was used for their off season “practice”. A trapeze was set up there, and two complete “high-wire” arrangements, one about three feet high, and the other at standard height for actual performances. The low one was for experiments and practice, and the high one to further refine the act. Hetty was being groomed to be a child performer of great skill and daring. Every day I sat and watched as her father and older brothers supervised her routine. They were very kind people, and they decided it would help Hetty to have more enthusiasm if she had a companion in her drills. I was soon included in the instruction process. I was having a great time learning to walk on a steel cable, jump rope on it, climb up and down the “webbing,” balance, slide and hang dramatically from my ankles on the trapeze (conveniently low to the ground!) and various other fun activities. I was thrilled to be shown all of Hetty’s gorgeous costumes, hand-made, sequined and beaded by her mother, and to stand in front of the shrine in their home dedicated to several relatives whose lives had been lost in the pursuit of their art. I was fascinated by the food they ate, the delicious smells that permeated their house at dinnertime, and the fact that they spoke their native language with as much ease as they spoke English. In short, I was having a ball, until Ed the stepfather discovered what was going on. You see, not only were they “foreigners,” they were Circus People; and worse than that: they were Catholic. I was forbidden to associate with, or speak to, Hetty. Now, Ed, a widower when my mother married him, had a 17-year old son, Devin. We overheard our grandparents telling our mother that Devin’s mother was dead was because Devin, himself, had shot her. It had been an accident, but we kept our distance from him nevertheless. I mean, how do you talk to someone who shot his own mother? Devin was a senior in high school, the drum major of the school band, so he had a lot of activities going on. He became interested in hypnosis and had several books on the subject. He wanted a subject to experiment on, and I was selected since my brother thought the whole thing was too stupid even to consider. 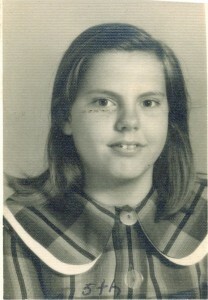 At this age, I wasn't a very good subject for hypnosis! I dutifully sat in a comfortable chair and tried to “relax,” though I was not altogether sure what “relaxing” meant. Devin dangled a pocket watch on a chain in front of my eyes while reading a script from his hypnosis book in a sonorous voice. I was watching the watch, then watching his face. He looked serious and prim. I had a vision of him in his drum major Indian outfit, a huge feather headdress trailing down his back, leaping and dancing, wearing brown make-up to cover his pale skin. Devin’s roles of serious hypnotist and leaping wild Indian struck me as too funny and I started to giggle. “Shush!” he said, and went back to reading his text while swinging the watch furiously in front of my eyes. I just completely collapsed in laughter and he slammed the book shut and stormed out of the room in disgust. He definitely avoided me after that. Meanwhile, the stepfather began showing his true colors. Despite the probable dangers our mother had exposed us to, her cold and selfish ways, she had been the only person ever to strike us for serious misdeeds (in her opinion). But Ed’s staunch Christian tenets demanded a thick leather Razor strop because sparing the rod spoiled the child. He also had a heck of a backhand. While he lived with us, my lips were regularly split and bloody. Ed’s formerly successful business was failing. Mother often borrowed money from the grandparents to pay the bills. He was under a lot of pressure. Ed’s decision to implement such modes of discipline on two kids who had never experienced any such thing up to that age was probably not the wisest thing the guy ever thought up. You have to remember the incident of the iron skillets to figure out how fiendish the two of us became under this regime. My grandmother called us perfect hellions. By this time, I was eleven, my brother was thirteen, and we were just getting warmed up! We quickly figured out the one disagreement between mother and Ed centered on the issue of dogs. Mother had been raised with dogs, she loved dogs, and we always had a dog that was part of the family. Ed detested dogs. 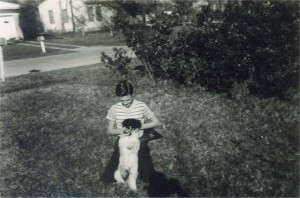 My brother with our little dog on the lawn of the house where we lived with "Ed" - the wicked, dog hating, step-father. The current dog had lived with the grandparents while we were away at school. We decided now we were at home to bring our dog back also. Mother, to our surprise, agreed with us immediately. But my grandmother wasn’t too pleased to give her up, making remarks about people who didn’t like dogs. “You can always tell about people by whether or not a dog likes them,” she muttered. Mother assured her that Ed was a good person, so he would naturally want the dog back too. Well, Ed wouldn’t admit he didn’t want the dog because that would make him look bad. The dog could come, but had to be kept outside. This, of course, eliminated the issue of whether or not the dog liked him. We weren’t worried. We would work on getting her into the house later. Of course the dog got pregnant staying outside. Florida is pretty steamy in the summertime, and the poor little pregnant doggie was suffering miserably in the “dog days”. We pointed out to Mother how hot it was and how much the dog was suffering, and she agreed that the dog should not suffer and we ought to bring her onto the screened porch. So, here is the set-up: the dog is not precisely inside the house, and not precisely outside either. She is pregnant and miserable. In the door walks the stepfather. The first thing that meets his eye after a long, hot, day at work, and a ride home in the blistering heat, is a DOG inside his house. Even if she is not technically “in the house”. I was sitting there reading when I heard him shouting about dogs in the house and how this particular one was going out this very instant. Something inside me snapped at that moment; like the bull in the meadow situation. Better to do something, anything, than to do nothing. I was going to wave the red flag and distract the bull. I told my stepfather piously that since my grandfather was paying the bills, his rules had precedence, and his rules consisted of kindness to defenseless animals. I knew a major backhand was coming, or possibly even the strop. I didn’t really expect him to open the door and kick my little dog through it like a football as hard as he could. She sailed through the air, yelping and crying in pain, landed on the pavement outside the door writhing and whimpering. Ed didn’t expect a berserker eleven-year-old to launch herself out of the chair and tackle him like a wildcat with tooth and nail and kicking feet that hit the “mark,” bringing him to his knees in an agony I only hoped was equal to that experienced by my poor little dog. By this time Mother made it to the porch to discover what all the racket was about. I am sure she never expected to see me with balled fists, blazing eyes, telling my stepfather through clenched teeth that if he ever touched my dog again I would kill him. I really meant it! I was literally panting from fury and exertion. I was really expecting doom to fall on my head in a big way. And I was ready to accept it. I had taken my stand, and even if all the fires of Hell had been the consequence, I wasn’t going to take it back. “She only did what I would have done if I had been here,” my mother said. She turned her back on him and walked into the house. With those startling words, Mother’s fifth marriage ended. There was icy silence all that evening, and Tommy and I decided it was the better part of valor to keep the dog out of sight completely. She was all right, but it could have been a disaster. The next day, after Ed left for work, Mother announced it was time to pack. This was Ed’s house, and she wouldn’t stay in it another night. Where were we going?